sparklingexpressions had a great time this weekend at the fundraising event for little Hayden at the Funhaven centre in Ottawa, Ontario. We were on hand with our glitter tattoo's to help add a little sparkle to the night and try to help raise a little more awareness and money for Hayden. To Learn a little more about Hayden please click on Haydens Story. 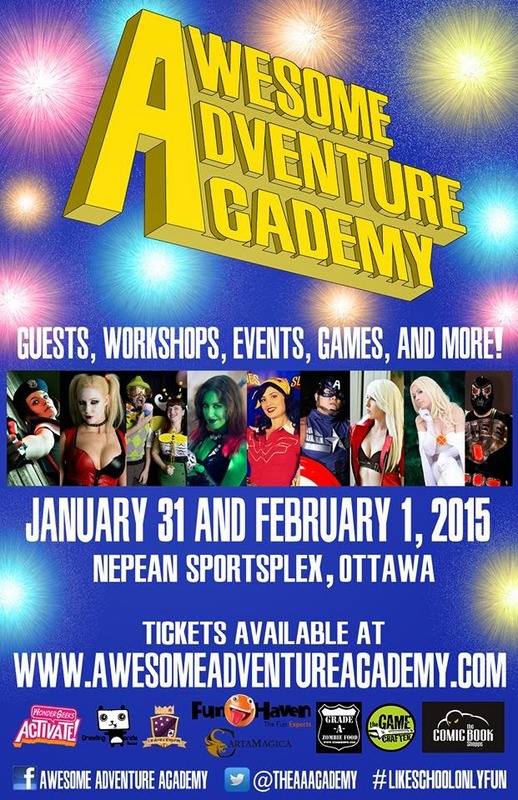 This coming weekend will find us in attendance at the Awesome Adventure Academy at the Nepean Sportsplex! January 31st and February 1st. A weekend of fun, guests, workshops, events, games and of course glitter tattoo's! local creatives from the Art, gaming and cosplay community will be on hand for the entire weekend of fun. So if you are into games, comic books, art work or costumes, then by all means come check us out, you wont be disappointed. It will be a Fun filled weekend! If you are curious as to what cosplay is all about, or perhaps you are curious to know what the Awesome Adventure Academy is all about then hop on over to youtube to check out this short video of the fun that was had during the weekend event. If you pay attention you will see the sparklingexpressions banner and a few of our vinyl wall decals.